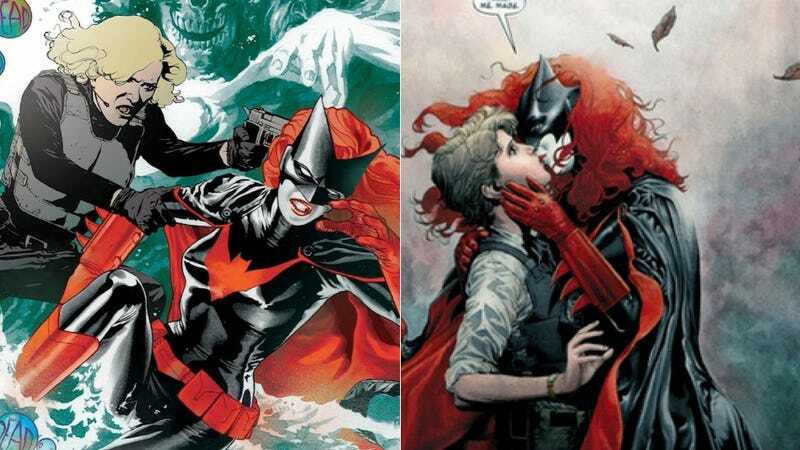 Less than three days since the controversy surrounding DC Comics’ refusal, we have a great non-explanation explanation from the DC brass about why the publisher refused to allow characters Kate Kane (Batwoman) and her partner, Gotham City police officer Maggie Sawyer, to marry each other. You ready? (I mean, it’s so obvious — you might be kind of embarrassed.) Ooookay — so, Batwoman can’t get married because she’s a hero, and, by the enduring logic of all the grimmest and grittiest storylines threading through the perpetually midnight streets of Gotham City, heroes should be miserable. Like, all the time, if possible. Speaking “off-script” — the classic, “hey, please don’t hold my words against me!” excuse of people who know, albeit dimly, that they're fighting a losing battle for public goodwill — at the DC Nation panel in Baltimore, DC co-publisher Dan DiDio felt he had to address the Batwoman gay marriage controversy, which he’d apparently just gotten wind of after being recently offline. For anyone else who’s been offline, briefly, DC forbid Kane/Batwoman to marry Sawyer (they didn’t merely refuse to depict it, as io9’s Rob Bricken had initially supposed — the marriage would no longer take place at all). Batwoman has proposed to Sawyer twice on panel, so the decision to forgo the marriage entirely left the creative duo behind Batwoman, J.H. Williams III and W. Haden Blackman, feeling pretty rotten, rotten enough, in fact, to quit. Williams and Halden — who made an official statement expressing their frustrations with DC’s decision to trash several important storylines — have since been replaced with Marc Andreyko, an openly gay writer whose abilities DiDio touted at the DC Nation panel (Andreyko will start work on Batwoman with issue #25). If that sounds like an incredibly convenient cop-out it probably is, considering that there are ONE THOUSAND ways for a character to be made even more unhappy after a marriage — the spousal kidnapping possibilities alone are endless. A married Batwoman is a more vulnerable Batwoman, in much the same way that Batman is more vulnerable with Robin (all you need to do is take a gander at the cover for A Death in the Family to see how). Suddenly, a character’s choices are contingent on another character. When a hero makes an emotional investment in someone, a whole new universe of dangers opens up, which gives us the ingredients for captivating human drama. That isn’t to say that marriage is the ultimate validation for an emotional bond, but these are all narrative tools anyway — “Batwoman, we have your wife” reads like a different villainous threat than, “Batwoman, we have the woman you’re currently sleeping with.” Culturally, wife/husband/father/mother/sister/brother are all words for family members, and a threat to a family member is something most readers understand instantly as being deadly serious. and make them look like assholes. If USA Gymnastics Dies, What Takes Its Place?